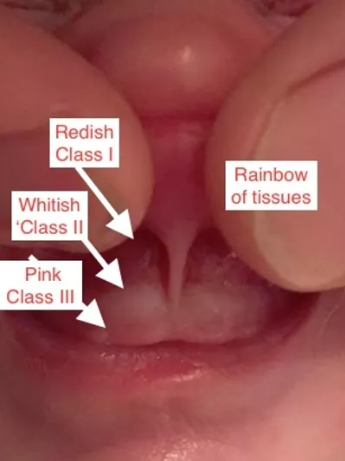 What is TOTs - Tethered Oral Tissues? TOTs are membranes that connect our lips to the alveolar bone, to chew and swallow. We have 7 membranes (frenums) in the oral cavity. One or all seven can be tight. When tight it restricts movement of the tongue to chew and digest properly. The frenums can anchor the tongue to block the airway causing open mouth posture- mouth breathing. This is not normal and will prevent the middle third of the face to develop. It is best to have a release sooner than later. Pre-Post exercises are a must to get the tissue ready for this minor surgical procedure. Post exercises to prevent premature reattachment - possible another release procedure. What professional does TOT releases? Let me say that NOT every professional provides these services. We at Muscles in Harmony have a list of professionals that are qualified, experienced and are not he same wave length as we are. As a Certified Myofunctional Therapist, assessment is needed then referred to the experienced professional. Some DDS's, few ENT's in AZ area, several pediatric DDS's are very knowledgeable. Some oral surgeons. We will help you make the decision for your needs and that of your child. Can you explain the procedure with laser? CO2 laser is currently the best laser choice at an office. As it is quick and prevents scar tissue. The patient usually is numb with local or topical anesthetic (does not need to be hospitalized unless behavior or health issues). Some children are given some medication before appointment for relaxation for easier working conditions for the team. Exercises before and after the release are a must to get ultimate success of range of motion and function. Pre-Post Exercises are they necessary? Seeing your Myofunctional Therapist will pay off, typically when someone has a TOT or several. The entire body has be compensating for these full body trouble makers. They affect the entire body, from torticollis, to headaches, speech, neck, back aches, shoulder pain, snoring and much more. Not only will the therapist do a comprehensive exam to check if something else in the mouth is off. Speech the tongue is pulling to one side, lisp. Not chewing correctly, not digesting normally. So much more. Call today, to have your assessment. Pat wrote this book because of her son's TOT issues. They have affected his body. These were not caught early enough - story in the book. Many of my patients have had severe issues and we have assisted in correction. It's a great feeling to help others that need these unknown services. Myofunctional Therapy has been on the medical grid for over 60 years. As a dental hygienist I was taught to discover abnormal oral issues, but to this length. Going back to school has been enlightening. I haven't stopped getting education, I love learning new things about the human body. This falls right into my idea of helping people as a whole person not just a head. Call us, ask questions, e-mail us. I am happy to get back to you on your concerns. Can these disorders or bad habits fixed forever? At the start of therapy many disorders are unknow until after a full complete assessment. With all information gathered, a consultation and photos will be reviewed. Our goal together is to completely eliminate all disorders. You the patient are a large part of total elimination. Practice means Permanent. Everyone is unique, so progress speed is based on each patients’ needs and life style.